The MEF-SDN/NFV Certified Professional is the first vendor neutral, ISO-level exam that validates individual knowledge and skills in the planning, building and operating domains of SDN and NFV based networks. The exam is expertly designed to certify real-world, technical skills of SDN and NFV professionals employed by communications and cloud service providers, technology solutions providers and large enterprises. 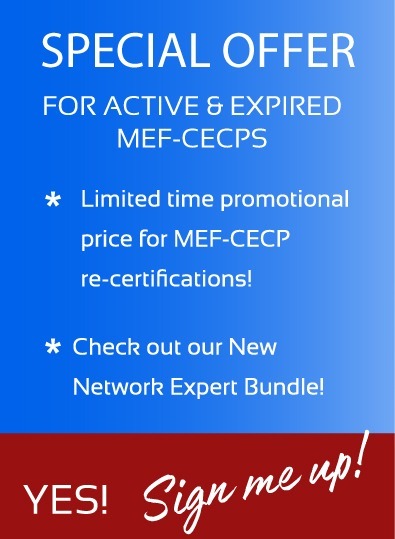 The MEF-SDN/NFV Certified Professional is a new, vendor-neutral certification for today's modern, software-centric network world, MEF- SDN/NFV Certified Professional validates the knowledge, skills, and abilities to plan, deploy, and operate a complete range of solutions in the highly-related SDN & NFV technologies. These are precisely the skills that are companies seeking for empowering today's software-driven advanced networks. In order to create this certification, experts around the world from both MEF and partner organizations gathered to identify the key skills required to thrive in these technical domains, the result of which is the first comprehensive accreditation or technical competence in SDN and NFV. MEF-SDN/NFV is positioned as a professional level, specialization certification within the MEF Professional Certification Framework. Earning three certifications within the MEF Professional Certification Framework including: MEF-NF, MEF-CECP and MEF-SDN/NFV, earns industry professionals the coveted MEF NETWORK EXPERT status. This certification exam presupposes foundational knowledge in networking practices, which can be validated by the introductory, concept-level MEF Networking Foundations (MEF-NF) certification exam. Create conceptual-level designs for SDN and/or NFV solutions (independent of technology). Self-study is available to anyone and recommended only for those with multiple years of direct SDN & NFV experience or for advance preparation for a formal training offered by MEF-ATPs. Self-study sources include the MEF-SDN/NFV Exam Blueprint and self-study options available through MEF-ATPs. If you already have foundation knowledge of SDN/NFV the exam blueprint is a primary reference. In that blueprint are key areas of study including reference materials.